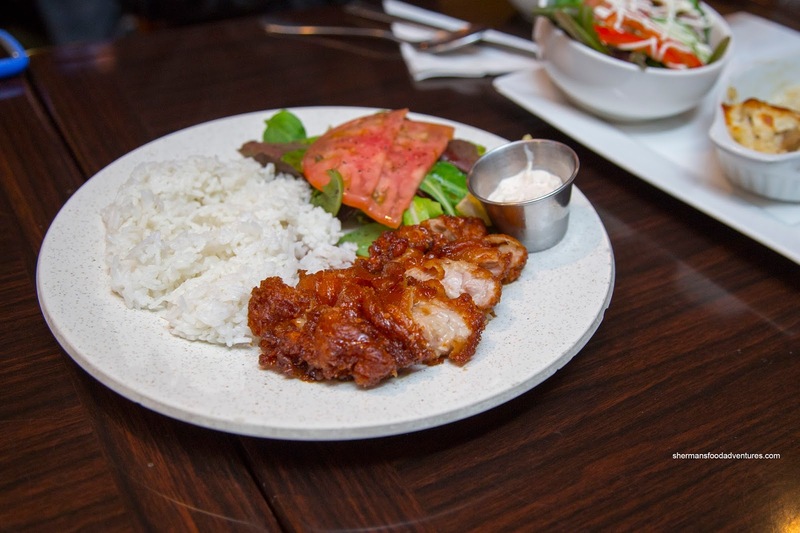 Ever since Yoshoku-Ya closed up shop only to reappear as 29th Ave Cafe, there weren't a whole lot of options when it came to Japanese-style Western cuisine. Now that 29th Ave Cafe is also long gone, that really limits our options. 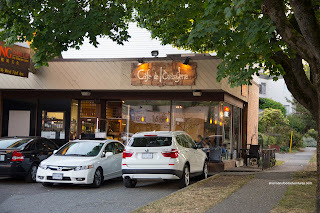 What we are essentially left with is Cafe L'Orangerie out in Marpole. I've tried visiting their old location on Granville a few years back, but they closed before we could make it after our softball game. Well, we finally made it before closing at their new location on 73rd and Hudson. 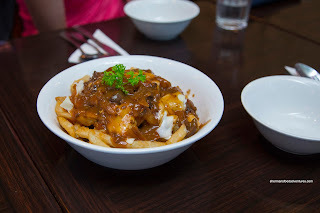 Since we were pretty famished from losing our softball game, we started with some appies including the Poutine Orangerie-Style with homemade beef stew sauce with mozzarella atop Cavendish fries. Despite relying on Costco fries, they were prepared crispy and held up well to the sauce. I found the sauce to be rather thick and mild-tasting with bits of ground beef, onion and mushrooms. There was a good amount of cheese though. 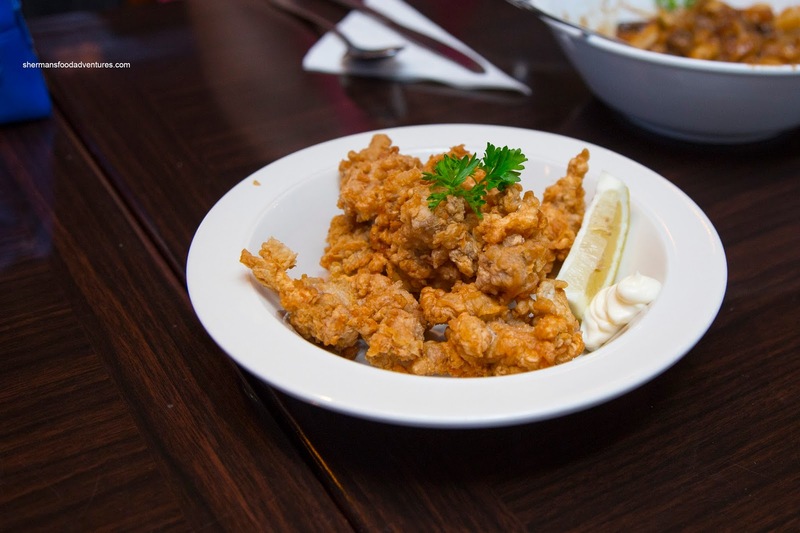 Next up was the Chicken Karaage which consisted of aggressively battered pieces of dark meat. As such, it was succulent and pretty juicy. The crunchy batter was properly seasoned where there was enough saltiness without the need for much mayo. Rather than having one entree each, we decided to share everything as a table. 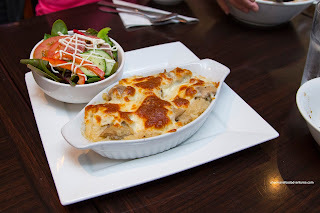 Arriving first was the Baked Chicken Curry Doria with a cheesy cream sauce on top of rice and baked. This was extremely cheesy and rich where there wasn't really much sauce. There was some saltiness from the cheese to flavour the dish while the chicken was a little dry. The chewy rice underneath was soaked in the limited amount of cream sauce. 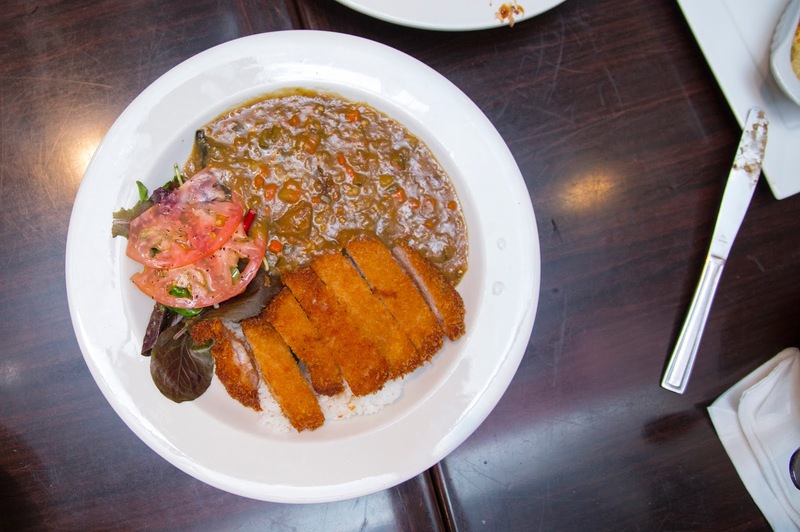 I felt we needed to try a Japanese curry so we got the Curry with Pork Cutlet. The cutlet itself was thick and nicely breaded where it was crunchy while keeping the moisture in (hence, the pork was tender and moist). I wasn't a huge fan of the curry though as it was more akin to a split pea soup with very little in distinguishing flavours. I didn't get much curry and in fact, I didn't even get much of that classic sweetness associated with Japanese curries. Milhouse thought the Hashed Beef Stew de Creamy Spaghetti and Hamburger Steak looked interesting on the menu (especially with the majestic picture). Well, the spaghetti was pretty good being somewhat toothsome and completely coated with a thick cream sauce. It wasn't particularly flavourful, but the textures were appealing. As for the hamburger steak, it was far too loose with too much filler in the form of onions. I prefer the firmer versions with only a little onion, not the amount in this one. The beef stew was the same as the poutine and it was lacking in depth. We also had another serving of the steak in the Hashed Beef Stew Special with 2 fried prawns and rice. However, the sauce on top was pretty sweet and thick, which made the dish one note in flavour. This time, the steak was breaded and fried, which added some texture, but ultimately, the meat was still mushy. 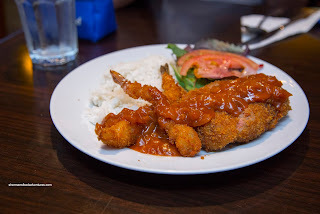 Our last savoury dish was the Chicken Nanban. Although the tempura batter on the outside was crunchy, it slid off each piece of chicken pretty easily. Despite this, the chicken itself was moist. We found the sauce to be more sweet than sour while the side of tartar was creamy with some tartness from the pickles. Moving onto dessert, we sampled 3 items on Bear's insistence. 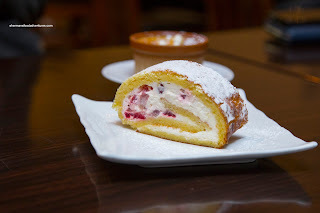 I gave the Strawberry Roll a try first and if I had to compare, this version falls far behind the one from Cake-Ya. First of all, the sponge cake was wet and soggy while the whipped cream was a bit clumpy. Second, there was just not enough strawberries. This could've been partially due to being late in the day. Exhibiting the effects of being subjected to high heat and rushed in the cooking process, the Homemade Caramel Pudding was far from smooth. 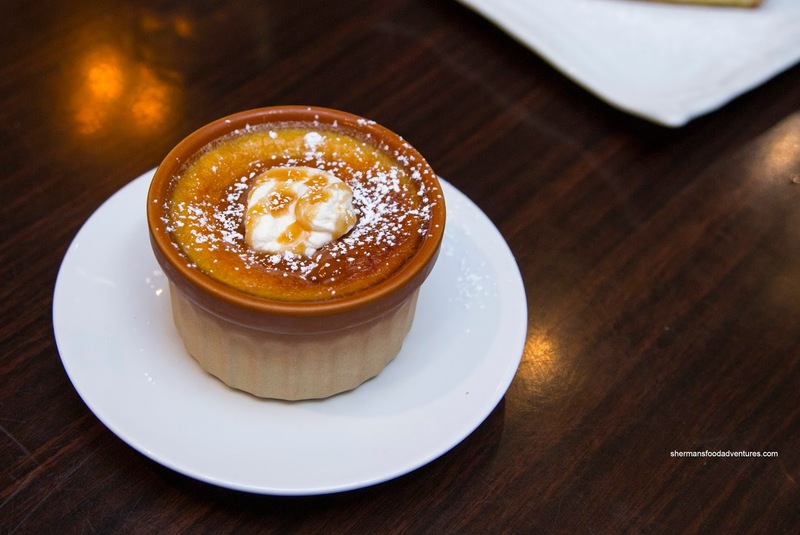 In fact, air bubbles afflicted the custard from top to bottom which made for a rough texture. It did taste okay though with some rich caramel hits without being too sugary. 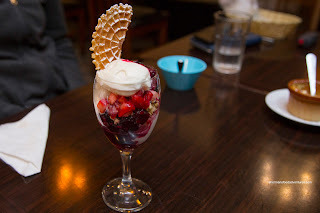 Lastly, the Berry Mochi Parfait with macerated strawberries and blackberries with mochi balls, rolled oats and ice cream. This was a fairly simple dessert where the soft mochi balls stood out. Otherwise, the berries were fresh and sweet that went well with the ice cream. Overall, we though the food at Cafe de L'Orangerie was okay, but lacking slightly in all dishes. By no means did we dislike the food, it's just that everything could've been better in some way. If you want to try really good youshoku, try Moncton Cafe in Steveston. 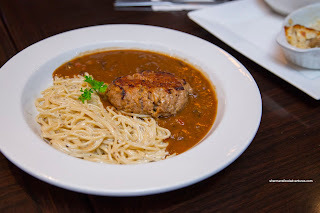 Their hamburger and curry are so good! @mschubbs Oh yeah! Thanks for the reminder!